James Vacca should know better. Just about every single plaza that DOT has built or approved (see here, here, here, and here) is sponsored by a local business association. The tiny handful that are not still have prominent local sponsors like Heritage Health and Housing in West Harlem. We reached out to Vacca’s office to ask him to specify some of the “many” plazas that have hurt small business. So far, there’s been no reply. As chair of the City Council Transportation Committee, Vacca has a talented staff to make sure he understands the issues. So why does he keep mangling them in public? Vacca can’t plead ignorance. At a hearing on public plazas in his own committee earlier this year, Vacca heard from representatives of four business groups: the 34th Street Partnership, the Dumbo BID, the Pitkin Avenue BID, and the South Bronx Overall Economic Development Corporation. Each of them raved about the plazas. Mario Bodden, the assistant vice president of community development at SoBro, had this to say about DOT’s Roberto Clemente Plaza to his fellow Bronxite: “I am so proud of it. I am very passionate about it. I want the City Council to put more money in the plaza program.” If business representatives like Bodden didn’t feel that way, they wouldn’t keep lining up to sponsor more plazas. The available data bolster what these business leaders know in their gut: A better pedestrian environment is good for the bottom line. Retail rents in Times Square continued to rise after DOT turned traffic lanes into public plazas on Broadway in 2009. This year Times Square cracked Cushman & Wakefield’s list of the world’s top ten retail districts for the first time. As for the effect of NYC bike lanes, hard data is scarce, but walk down any of the commercial avenues with protected lanes, and the retail environment looks healthy. Yes, Columbus Avenue business owners complained about the new bike lane’s effect on parking and deliveries, but merchants are notoriously bad judges of the issue, and a 2007 survey found that only two percent of the people on Columbus Avenue got there by driving [PDF]. Studies from other cities, meanwhile, show solid evidence that bike lanes can improve business. re: Columbus Ave. People on the UWS have a lot of choices (Bway, Amsterdam, Columbus). What’s so interesting to me is that my friends who live near on West End Avenue never used to walk all the way over to Columbus. But now they do, because with the bike lane, the street is much calmer and attractive. Try Joe’s coffee and the market behind the Natural History museum. Columbus is now a great place to stroll because of the bike lane. Just wish the bike lane on Columbus wasn’t a dead end on both sides. If it connected to the rest of the network, more people would come. Even with stellar competition from the likes of Louise Hainline, Iris Weinshall, Norman Steisel and Jim Walden, Jimmy Vacca is shaping up as a formidable contender for a worst-offender Streetsie Award. He rarely opens his mouth these days with out uttering something that betrays an embarrassing ignorance of the way streets function. There was that fossil store on Columbus Avenue that went out of business. It wasn’t the economy or rising rents that contributed to the end of that business’ run…it was the bike lane and the loss of about three parking spaces. If a New Yorker can’t stop his car right in front of a store, pop in and walk out five minutes later with a $10,000 T-Rex mandible, how can any business be expected to survive? Ignoring research and facts; Ignoring his own his own advisers; maybe the Tea Party will endorse him next election. He was already endorsed by the republican party last election. Vacca hails from one of the most auto-centric portions of New York City, and his life in the racially-discriminating gated community of Silver Beach Gardens is even more auto-dependent than most of his constituents. He exhibits, somewhat understandably and inevitably, a combination of his own personal experiences and the views of those closest to him. The real problem was the decision to assign this Chair position to somebody so poorly aligned with the needs and values of New York City. That is an auto-centric hairstyle that he has. I think you need the still atmosphere of a car to maintain that peculiar combination of density and airiness. Someone find out if he’s getting paid by the auto-lobby and related lobbies. His obsession goes beyond reason. I’m fully serious. Streetsblog and TranspoAlt should launch an investigation. He was the keynote speaker at the New York AAA Safety Awards in October. He’s speech ignored any safety measures the NYC DOT had accomplished and complained that they were not filling potholes quickly enough. He was invited because he gave AAA an anti-plaza quote in their anti-plaza article in the newsletter. Could be more? 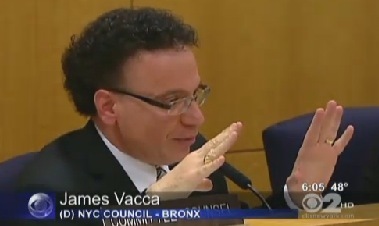 James Vacca is not a transportation expert. He does not work for reason and data. He is a politician who works for complaining business that go to his office and ask him to do something about the bike lanes they feel are hurting their business. He works for lobbyists that advocate for drivers rights who donate to his campaign fund and ask him to do something to obstruct the progressive policies at DOT. His job, like virtually all politicians, is to be responsive to the demands presented to him and to get re-elected. I don’t think the livable streets community has gone to him and given him any reason to do other than what he has done, partly because with so many things going our way over at DOT, what reason would there be to go complain to him? Why does Vacca always look like he’s in a defensive posture (like a sparing partner that is blocking punches) from whoever he is speaking to. Dude needs to relax and not be so uptight.